Thank you for supporting athletes like myself to reach our goals! I have had plenty of adversity to overcome 3 stress fractures in 6 years traininig. My coach and I have learned so much about my vault and training, we have so much to improve on leading to an exciting future! I had a jump off at the outdoor USA championships to qualify for the London team after a tough NCAA meet. I am a 6-time all American but could not have done it without my coach and teammates. Born and raised in Pontiac, IL, Emily was an all-around athlete while attending Pontiac Township High School. Not only did she bring home two state titles and a state record in the pole vault, but she also competed in the 4x200m and 4x400m relays, cross country, and volleyball. 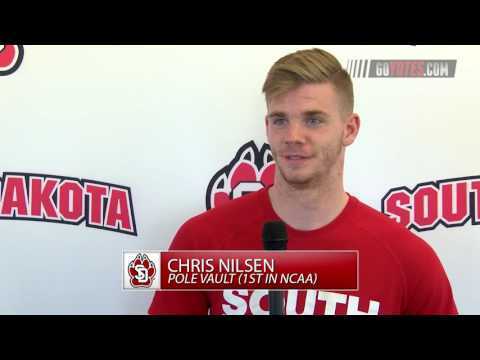 When she left Illinois to attend University of South Dakota, she was going as one of the top vaulters in the nation. While competing for the Coyotes, Emily would become a six-time All-American, an NCAA runner-up finish, and a mountain of conference honors, all while earning both an undergrad and a Master's degree in Kinesiology. Though Emily was still in college, she placed herself among the country, and world, elite with a 6th place showing at the 2012 World Junior Championships as a true freshman, also earning a chance to compete at that year's Olympic Trials; then in 2016, jumped to a 10th place finish at the Olympic Trials. In 2017, while finishing up her collegiate eligibility, Emily finished third at the USA Championships, which earned her a spot on the World Championships team in London. Off the track, Emily enjoys the outdoors, particularly fond of kayaking and biking, and when younger, she used to show horses. Now working full-time for the University of South Dakota's financial aid office, she keeps busy helping students with their educational affairs, followed by training after work which then gives her the opportunity to assistant student-athletes with their jumps. When her time on the runway and vaulting high is finished, Emily would like to attend Chiropractic school, and "give back to athletes and the community as much as I can as they have helped me so much throughout my pole vaulting career."